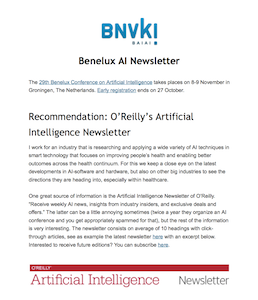 The BNVKI newsletter is distributed quarterly and contains information about conferences, research projects, job opportunities, funding opportunities, etc., provided enough information is supplied. 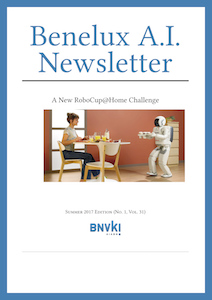 Therefore, all members are encouraged to send news and items they consider worthwhile to the editorial office of the BNVKI/AIABN Newsletter. SIKS is the Netherlands Research School for Information and Knowledge Systems, founded in 1996 by researchers in the field of Artificial Intelligence, Databases & Information Systems and Software Engineering. 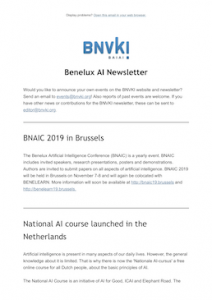 From 1999 until 2012 SIKS had its own section in the BNVKI-newsletter, mainly containing announcements of courses, symposia, lectures, phd-defenses and other activities. 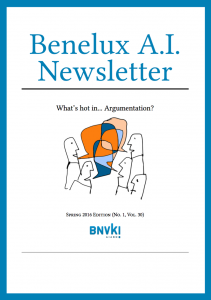 After a hibernating period of three years the Newsletter was reestablished in 2015 in an electronic format. 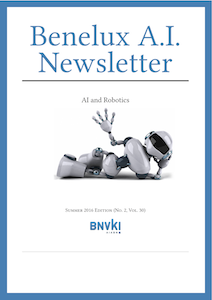 As of 2016 SIKS will continue to provide information to its members in its own section in the BNVKI-Newsletter. For all questions on SIKS, please contact the managing director of SIKS, Dr. Richard Starmans or visit the website www.siks.nl. We will store your data in a secure manner and will not share it with anyone. We will only use your data to send out our newsletter, from which you can unsubscribe at any time. Event announcements and reports can be sent to: events@bnvki.org. 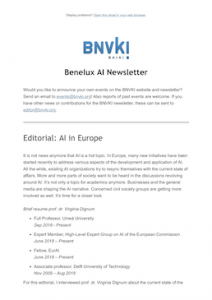 Other contributions, remarks or questions regarding the newsletter can be sent to: editor@bnvki.org. Initially, the Newsletter was distributed as hard-copy. 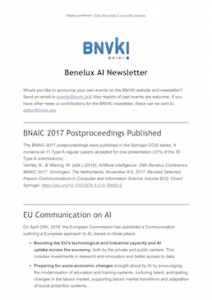 After a hibernating period of three years the Newsletter was reestablished in 2015 in an electronic format.